Capture the spirit of your special day with fun, exciting and stylish details! Add a playful touch to your trendy trimmings and give your guests a personalized paper coaster to put under their drinks. Our fabulous selection of paper coasters will add an extra-special custom trimming to your table top decor or drink stations. 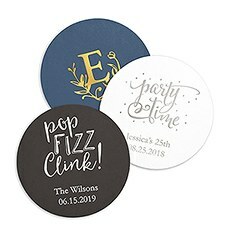 These super affordable paper coasters can help you add a colorful, inexpensive personal touch to your wedding, party or event. You'll be thrilled with the great quality at a great price - our coasters are made with durable 36-point thick pulpboard and come in packages of 100.Choose your favorite shape and design - from round, square to scalloped edges. 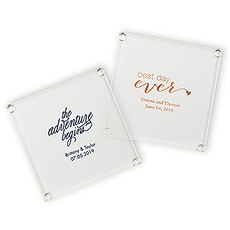 We've got you covered with these fabulously fun trimmings that deliver unique sayings to your guests, such as, "All you need is love," "Mr. and Mrs.," and "Eat, Drink, Marry! "These custom wedding and event coasters from The Knot Shop will help you keep in line with your party's theme - are you fun, traditional, easy-going or modern? Choose from a wide range of colors, sayings and designs. Each set can be custom ordered - pick the logo design and theme that best depicts you, your wedding or your sentiments. Encourage your guests to toast, have a good time or let the sparks fly! Choose from a variety of sayings that are right for any occasion - from anniversaries and weddings to engagements, New Year's or birthdays! These personalized paper coasters cover a wide range of occasions. 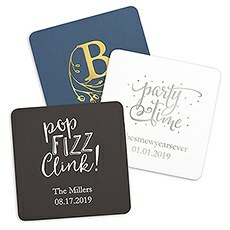 Personalize up to two lines and make them truly your very own!You have the ultimate control, up to the color of the imprinting of the lovely foil impression on each coaster. And we've made it easy-peasy for you to see exactly what you have chosen - preview your designs before you take the plunge and add them to your cart. Make sure they are just right! Go ahead - play with our preview generator and have fun. Consider these festive paper coasters each and every time you have an event or a party. Put that personal spin on your soiree!You'll love these custom, playful paper party coasters from The Knot Shop for every reason to celebrate in your life!